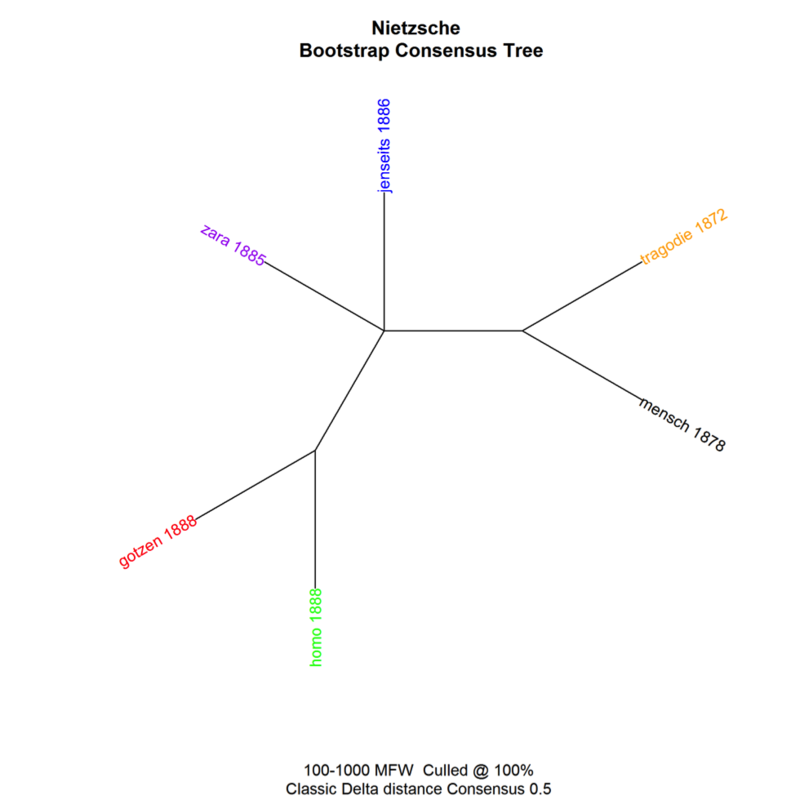 One of Nietzsche’s friends, a composer, noticed a change in the style of his writing. His already terse prose had become even tighter, more telegraphic. “Perhaps you will through this instrument even take to a new idiom,” the friend wrote in a letter, noting that, in his own work, his “‘thoughts’ in music and language often depend on the quality of pen and paper.”... “You are right,” Nietzsche replied, “our writing equipment takes part in the forming of our thoughts” (Carr 2008). Stylistics and perhaps above all its younger and computerized daughter, stylometry, have already attempted to find stylistic or stylometrical traces (the "author signal") of similar changes in writing practices by authors – with little positive result. The case of Henry James’s move from handwriting (typewriting) to dictation in the middle of What Maisie Knew has been studied by Hoover (2009). Yet, according to the NYU professor, the author of The Ambassadors took this sudden change in his stride and, despite the fact that we know exactly where the switch occurred, stylometry has been helpless in this case; or, rather, can show no sudden shift in James’s stylistic evolution that continues throughout his career (Hoover 2009). In a way, a similar problem was addressed by Le, Lancashire, Hirst and Jokel (2011) in their study of possible symptoms of Alzheimer’s disease in Agatha Christie word usage and to confirm the same diagnosis in Iris Murdoch. From another perspective, many studies exist on various authors’ switch from handwriting or typing to word processing (see also Lev Manovich's  work on cultural analytics). Heinrich Köselitz, Geneva, Feb 17, 1882. 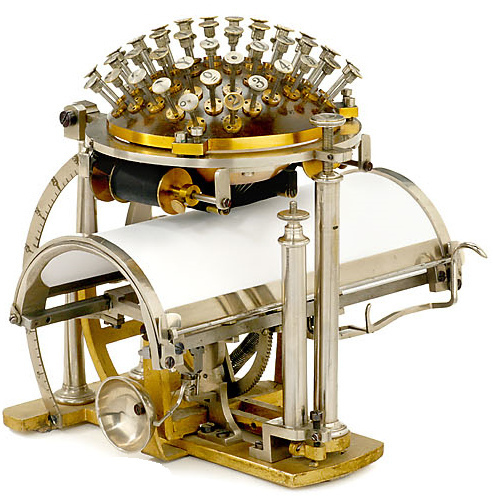 Neitzsche's reasons for purchasing a typewriter were very different from those of his colleagues who wrote for entertainment purposes, such as Twain, Lindau, Amytor, Hart, Nansen, and so on. They all counted on increased speed and textual mass production; the half-blind, by contrast, turned from philosophy to literature, from rereasing to a pure, blind, and intransitive act of writing (Kittler 1999: 206). In other words, the inscription technologies of Nietzsche's time have contributed to his thinking. Nevertheless for Nietzsche the typewriter was "more difficult than the piano, and long sentences were not much of an option" (Emden 2005: 29). Although after his failed experimentation with the typewriter, he remained enthralled by its possibilities – "the assumed immediacy of the written word... seemingly connected in a direct way to the thoughts and ideas of the author through the physical movement of the hand... was displaced by the flow of disconnected letters on a page, one as standardized as another" (Emden 2005: 29). The turning point for Kittler (1999) is represented by The Genealogy of Morals which was written in 1887 – by now Nietzsche was forced by continued poor vision to use secretaries to record his words. Here, it is argued that Nietzsche elevated the typewriter itself to the "status of a philosophy," suggesting that "humanity had shifted away from its inborn faculties (such as knowledge, speech, and virtuous action) in favor of a memory machine. [When] crouched over his me­chanically defective writing ball, the physiologically defective philosopher [had] realize[d] that 'writing . . . is no longer a natural extension of humans who bring forth their voice, soul, individuality through their handwriting. On the contrary, . . . humans change their position – they turn from the agency of writing to become an inscription surface'" (Winthrop-Young and Wutz 1999: xxix). In the very tentative analysis presented here (and which must be redone with a greater collection of Nietzsche’s works), the standard stylometric procedure of comparing normalized word frequencies of the most frequent words in the corpus was applied by means of the “stylo” (ver. 0-4-7) script for the R statistical programming environment (Eder and Rybicki 2011). The script converts the electronic texts to produce complete most-frequent-word (MFW) frequency lists, calculates their z-scores in each text according to the Delta procedure (Burrows 2002); uses the top frequency lists for analysis; performs additional procedures for better accuracy (including Hoover’s culling, the removal of all words that do not appear in all the texts for better independence of content); compares the results for individual texts; produces Cluster Analysis tree diagrams that show the distances between the texts; and, finally, combines the tree diagrams made for various parameters (number of words used in each individual analysis) in a bootstrap consensus tree (Dunn et al. 2005, quoted in Baayen 2008: 143-147). The script, in its ever-evolving versions, is available online (Eder, Rybicki and Kestemont 2012). The consensus tree approach, based as it is on numerous iterations of attribution tests at varying parameters, has already shown itself as a viable alternative to single-iteration analyses (Rybicki 2012, Eder and Rybicki 2012). The first analysis was performed for complete texts of six works by Nietzsche: Die Geburt der Tragödie (1872) and Menschliches, Allzumenschliches (1878), both written before 1879, his “year of blindness,” and his typewriter experiments of 1882, and Also sprach Zarathustra (1883-5), Jenseits von Gut und Böse (1886), Ecce homo and Götzen-Dämmerung (1888). The resulting graph suggest a chronological evolution of Nietzschean style as the early works cluster to the right, and the later ones to the left of Figure 1. Yet the pattern above shares the usual problem of multivariate graphs for just a few texts: a possibility of randomness in the order of clusters. This is why it makes sense to perform another analysis, this time on the above texts divided into equal-sized segments (10,000 words is usually safe). 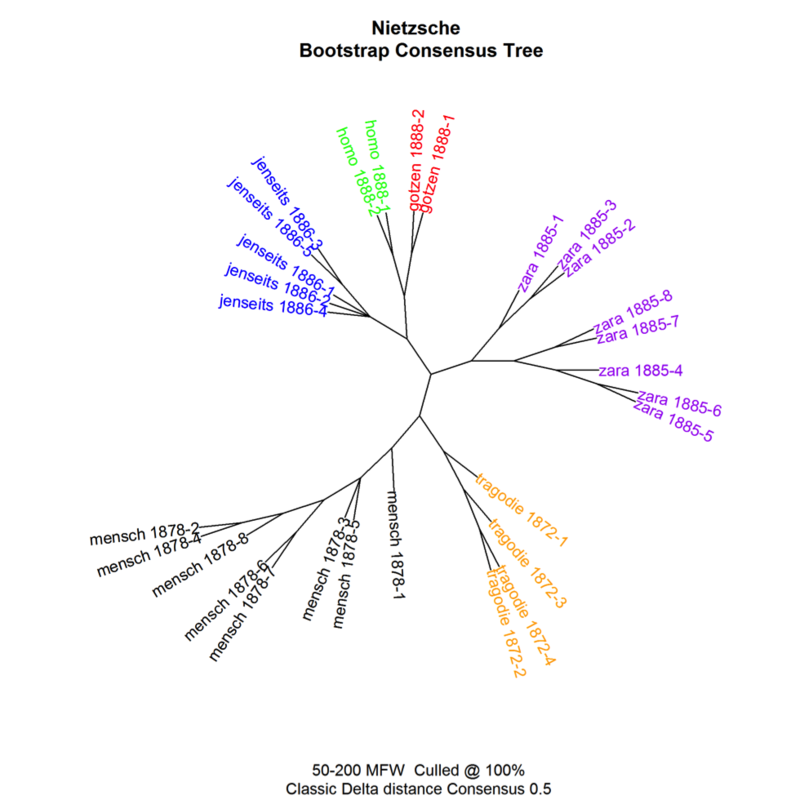 Figure 2 confirms the chronological evolution pattern as the segments of each individual book are correctly clustered together. What is more, the previous result is corroborated by a very similar pattern in terms of creation date. As has been said above, a greater number of texts is needed to confirm these initial findings. There is indeed a clear division of Nitzschean style into early and late(r). Whether this is a repetition of a phenomenon observed in many other writers (Henry James, for one), or a direct impact of technological change and therefore a confirmation of the claims of medium theory, remains to be investigated. Nonetheless, this approach offers an additional method to explore how medial change can be mapped in relation to changes in knowledge. 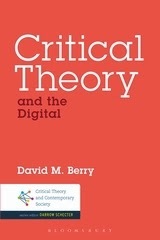 It also offers a potential means for exploring the way in which contemporary debates over the introduction of computational and digital means of creating, storing and distributing knowledge affect the way in which authorship itself is undertaken. This doesn't just have to be strictly between mediums, and there is potential for exploring intra-medial change and the way in which writing has been influenced by the long dark ages of Microsoft Word as the hegemonic form of digital writing (1983-2012), and which gradually appears to be coming to an end in the age of locative media, apps, and real-time streams. 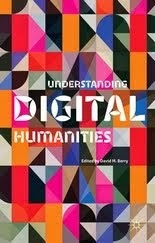 Indeed, with exploratory digital literature forms, represented in ebooks, computational document format (CDF) and apps, such as Tapestry, which allow the creation of "tap essays" (Gannes 2012), new ways of authoring and presenting knowledge are suggested. Only a short perusal of Apple iBooks Author, for example, shows the way in which the paper forms underlying the digital writings of the 20th Century, are giving way to new ways of writing and structuring text within the framework of a truly digital medium made possible through tablet computers, smart phones and the emerging "tabs, pads and boards" three-screen world. Equally, today in a world filled with everyday computational media, Europeans and North Americans are learning very quickly to adapt to the real-time streaming media of the 21st Century. We are no longer surprised when live television is paused to make a drink, or our mobile phone tells us that we are running late for a meeting and offers us a quicker route to get to the location. Nor are we perplexed by multiple screens, screens within screens, transmedia storytelling, social media, or even contextual navigation and adaptive user interfaces. 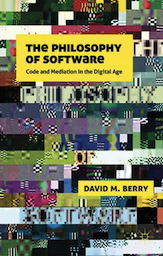 Thus new social epistemologies are emerging in relation to computational media, that is, "the conditions under which groups of agents (from generations to societies) acquire, distribute, maintain and update (claims to) belief and knowledge [has changed] through the active mediation of code/software" (Berry 2012: 380). Again, a historically changed mode of perception has entered everyday life, and which we can explore through its traces in cultural artefacts, such as literature, film, television, software and so forth. With the suggestive analysis offered in this short article, we hope to have demonstrated how computational approaches can create research questions in relation to medium theory, and which although not necessary offering conclusive results, nonetheless press us to explore further the links between medial and epistemic change. According to Günzel and Schmidt-Grépály (2002), Nietzsche typed 15 letters, 1 postcard and 34 bulk sheets (including some poems and verdicts) with his 'Schreibkugel' from Malling-Hansen in 1882. Burrows, J.F. (2002) “Delta: A Measure of Stylistic Difference and a Guide to Likely Authorship,” Literary and Linguistic Computing 17: 267-287. Dunn, M., Terrill, A., Reesink, G., Foley, R.A. and Levinson, S.C. (2005) “Structural Phylogenetics and the Reconstruction of Ancient Language History,” Science 309: 2072-2075. Quoted in Baayen, R.H. (2008) Analyzing Linguistic Data. A Practical Introduction to Statistics using R, Cambridge: Cambridge University Press. Eder, M. and Rybicki, J. (2011). Stylometry with R. Stanford: Digital Humanities 2011. Eder, M. and Rybicki, J. (2012). “Do Birds of a Feather Really Flock Together, or How to Choose Test Samples for Authorship Attribution,” Literary and Linguistic Computing, First published online August 11, 2012: 10.1093/llc/fqs036. Emden, C. (2005) Nietzsche On Language, Consciousness, And The Body, University of Illinois Press. Kittler, F. A. (1992) Discourse Networks, 1800/1900, Stanford University Press. Kittler, F. A. 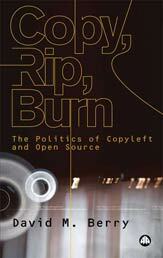 (2009) Optical Media, London: Polity Press. Hoover, David L. (2009) “Modes of Composition in Henry James: Dictation, Style, and What Maisie Knew,” Digital Humanities 2009, University of Maryland, June 22-25. Rybicki, J. (2012) “The Great Mystery of the (Almost) Invisible Translator: Stylometry in Translation.” In Oakes, M., Ji, M. (eds). Quantitative Methods in Corpus-Based Translation Studies, Amsterdam: John Benjamins. Winthrop-Young, G. and Wutz, M. (1999) Translators' Introduction, in Kittler, F. A., Gramophone, Film, Typewriter, Standford University Press.